Alan Greenspan (born March 6, 1926) is an American economist. 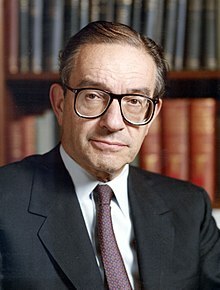 Greenspan was born on March 6, 1926 in New York City, New York to a Romanian-Hungarian-Jewish family. He studied at George Washington High School and at New York University. He was the Chairman of the Federal Reserve of the United States from 1987 to 2006. He currently works as a private adviser and provides consulting for firms through his company, Greenspan Associates LLC. He was awarded the Presidential Medal of Freedom in November 2005. Greenspan was first appointed Federal Reserve chairman by President Ronald Reagan in August 1987. He was reappointed at successive four-year intervals until retiring on January 31, 2006 after the second-longest tenure in the position. Greenspan was married to Joan Mitchell from 1952 until they annulled their marriage in 1953. He married Andrea Mitchell in 1997. He now lives in New York City and in Washington, D.C..
2003 speech by Greenspan about "Market Economies and Rule of Law"
This page was last changed on 3 November 2017, at 19:22.